This thick, creamy smoothie gets a protein kick from raw cashews. Soaking the nuts in water before blending makes them super smooth. Ripe, juicy peach takes center stage in this summery beverage, while a frozen banana is packed with potassium and rounds out the flavor. Superfood goji berries have a myriad of health benefits, including boosting immunity, increased calorie burning and powerful antioxidants. Adding just a tablespoon of the dried fruit will have you bursting with vitality all day long. Sip after your workout for a great energy boost. Soaking cashews overnight helps them break down completely when blended. If you can't get good, ripe peaches, frozen peaches are often better quality than fresh because they are frozen when the fruit is at peak ripeness. Sub 1 cup frozen peaches instead. Per Serving: 270 calories; 6g fat; 54.8g carbohydrates; 6g protein; 0mg cholesterol; 98mg sodium. 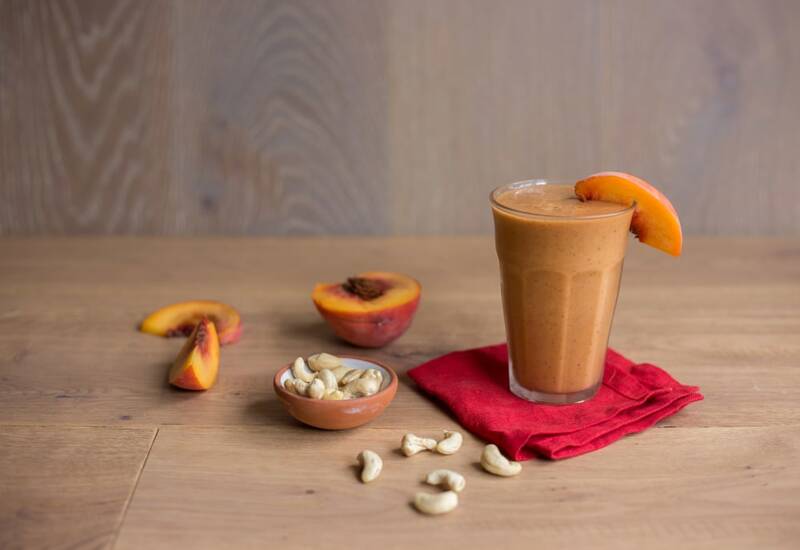 This smoothie is especially delicious when peaches are in-season. I bought mine at the farmers' market and made it this morning. The banana added sweetness and the cashews give it great body. Pretty much a full meal in a glass! This was very creamy and delicious. Soaking the cashews overnight is a must! It makes the texture nice and thick, like a proper smoothie. I also really liked the added goji berries, I think I will use them in all my fruit smoothies now.